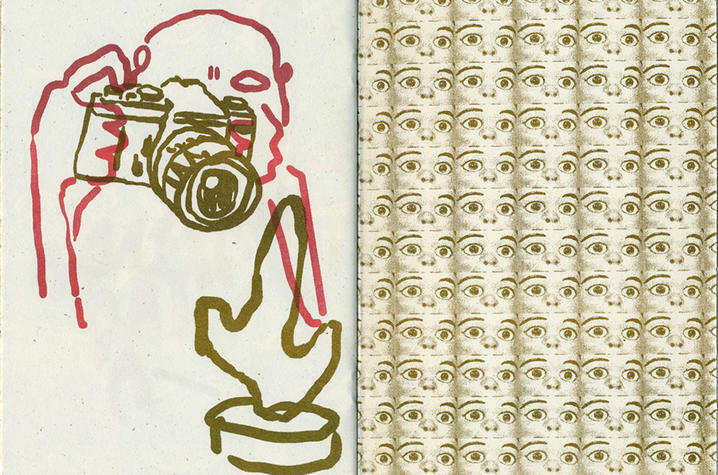 Detal image of "Face Factory," a Risograph zine, by David Wischer. Courtesy of the artist. LEXINGTON, Ky. (Jan. 16, 2019) — The University of Kentucky Art Museum in partnership with the UK School of Art and Visual Studies will present a hands-on workshop on how to use a small proofing press and a Risograph machine. The free public workshop begins today (Jan. 16) and will run through Jan. 19 at the museum, and will also serve as part of an upcoming fundraiser. This essentially turns the museum’s main gallery into a studio for several days. As part of this week’s workshop, guests will have the opportunity to work with a printmaking machine to create original artworks. Attendees will also have the chance to work with a Risograph, a machine typically used for the production of small publications known as “zines.” The Risograph creates a unique print quality, similar to the separation of colors in silkscreen. Museum staff and faculty from UK’s School of Art and Visual Studies will lead the monoprints and Risograph workshop and will be available for questions throughout the event. Individuals can participate during museum gallery hours noon-5 p.m. Wednesday, Thursday and Saturday, and noon to 8 p.m. Friday. All materials will be provided, and attendees will be able to make unique works of art on paper, posters and books. The only catch, UK Art Museum asks for the donation of one print to be sold for the benefit of the museum. In addition, Assistant Professor of Digital and Print Media David Wischer will give an Instant Mini-zine Workshop 2-3:30 p.m. Thursday and Saturday, Jan. 17 and 19, at the museum. As part of this free public workshop, participants will make an eight-page mini-zine using one sheet of paper by learning how a series of clever folds and one cut with scissors can easily create a small zine without staples or binding. Paper and mark making materials will be provided for this as well, and volunteers will be on hand to explain and demonstrate the process. Individuals interested in attending are asked to bring their own images (2.5 inches by 4 inches per page) or create drawings or writing during the workshop. The UK School of Art and Visual Studies, also part of the College of Fine Arts, is an accredited member of the National Association of Schools of Art and Design and offers undergraduate and graduate degrees in the fields of art studio, art history and visual studies, art education, and digital media and design.